Many Japanese people, for some reason, love western things, so much so that their traditional cafes from the Shōwa period (1926–1989) are full of western-style memorabilia, from small statues, chandeliers, colourful carpets, comfy chairs and stained glass windows. What is called Shōwa-style is often a highly kitsch mixture of strong colours and a hodgepodge of mismatching collectibles. A perfect example of the Shōwa-style cafe can be found in Sugamo, a place that can be viewed all together as being a little bit back in time inside of the Tokyo metropolis. Dubbed grandmas Harajuku, this place is home to many traditional shops and eateries. Hakushaku cafe near Sugamo station is a prime example of the Shōwa style. This place has all of the above mentioned elements. Hakushaku is a small chain of cafes with a two locations in Ikebukuro (one near north exit and one near east exit) and one in Sugamo. In fact, Japan used to be full of these places. If you would go to a cafe in the 90s in Japan, you would go to one of these Shōwa cafes. In Japanese they are called kissaten (喫茶店), which translates as a sort of tearoom where you can also drink coffee and eat sweets. It used to be the generic translation for “cafe” in textbooks for learning Japanese. However, nowadays with the emergence of Starbucks and other chains, the word kissaten is less used and came to be associated with these Shōwa-style cafes. The store front (side street). The cafe has two entrances, one on the main street (Hakusan-dōri) and one on the small side street. One major drawback to enter this type of places is the smoke. As a non-smoker, I must admit I do not enjoy spending time in smoke-filled rooms. While I used to be ok with it, growing up with smokers all around me, my tolerance unfortunately got lower as in general I only frequent non-moking establishments. 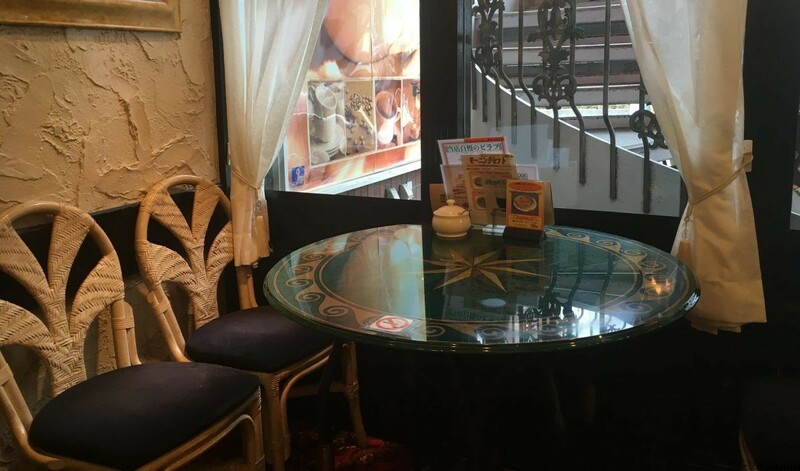 While some of these Shōwa cafes have non-smoking seats, they are largely a smokers paradise, with no particular suction installation or proper partitioning of the smoking and non-smoking seats. Attitudes in Japan are changing though. When I first came to Japan mid-2000s, having a coffee or lunch somewhere in a smoke filled room was an often occurring experience. Now, in 2016, a Health Ministry panel is urging for a ban on smoking indoors in public spaces, including restaurants. So if you are a smoker and cannot wait to enjoy these Shōwa places to the fullest, do not wait too long before visiting. These kissaten often serve a simple breakfast or lunch. The breakfast menu here is reasonably priced and the coffee is very strong. 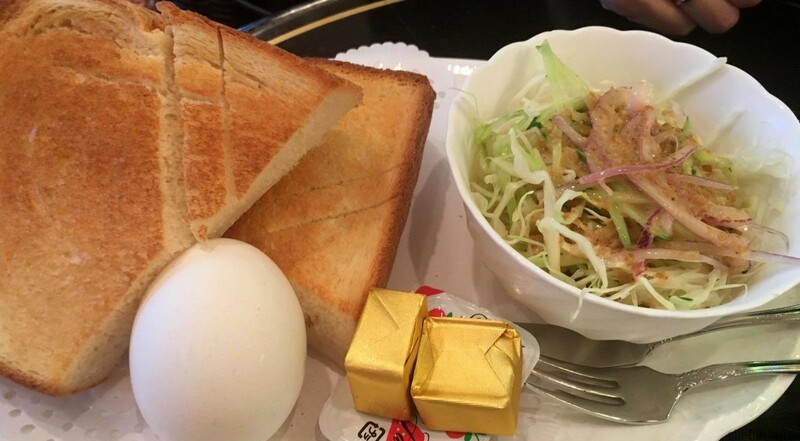 A breakfast set including coffee costs JPY 630 (in 2016). Take the south exit of Sugamo station, and walk straight on Hakusan-dōri for 1 minute. The cafe is on your left hand side. 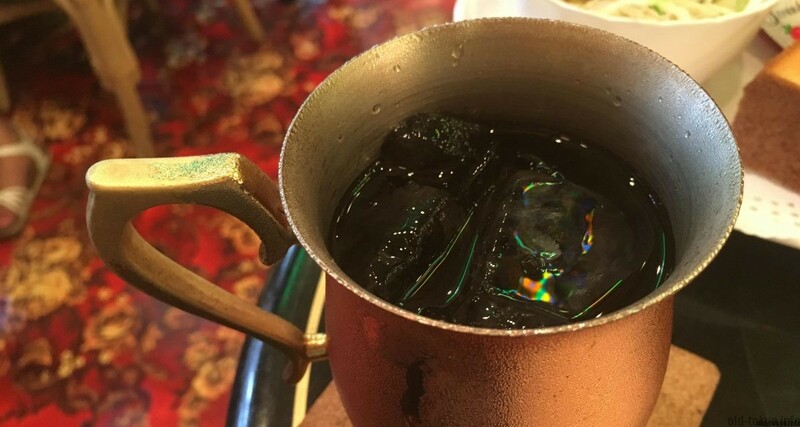 Kissaten in Japan are infamous for their steep prices, expect to pay JPY 500 or more for a mediocre coffee, it is more economical to order a breakfast, lunch or cake set.